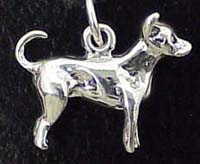 - Dog - Chihuahua Charm is approximately 1/2" X 1/2"
Inspired by the natural beauty of the Chihuahua dog, this sterling silver Chihuahua dog charm is a lovely piece of handcrafted jewelry. The Chihuahua charm would be a gleaming addition to any jewelry collection. Perfect for all Chihuahua lovers. Approximately 1 inches x 1/2 inches in size. 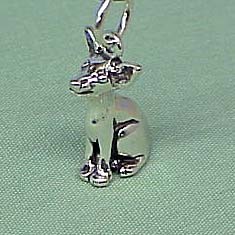 This sterling silver Chihuahua charm is a special piece of handcrafted jewelry. Each Chihuahua charm would be a gleaming addition to any Chihuahua jewelry collection. It makes a nice Chihuahua gift item. Approximate size on the Chihuahua charm is 5/8 inches. The sculpted image of this miniature Chihuahua, captured in antiqued sterling silver, will win its way into your heart. It measures approximately 13 x 10mm with a 4mm core that is interchangeable as well as compatible with Reflections, Expression, Kera, SilveRadoand other popular 3mm bracelets and necklaces.